To top off our quest for creative composition last month we ended the month with a some fun group lesson games. After completing the opening scale pattern coloring page and playing a fun game of Mystery Food Improv, I came up with a technique pattern bingo game to solidify students recognition of the names and patterns in their keyboard skills exercises. It is a quick game that could also be used as a fun lesson starter during private lessons. I created some simple patterns on MuseScore (free notation software) and then cut and pasted them to form bingo grids. For new beginners I included labels for the patterns. 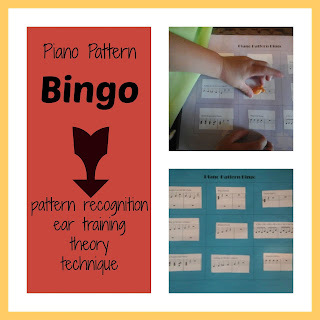 As I played a pattern on the piano, students listened to find the matching patterns on their Bingo cards. Even early beginners who haven't been introduced to notes on the staff were able to identify most patterns based on the contour of the notes. More experienced students had Bingo cards without labels and were asked to identify the name of the pattern they heard. Challenge Version: I plan to make a variation that includes more difficult patterns such as I, I6 and I64inversions, authentic and half cadences, Major, minor, augmented and diminished chords, and chromatic, melodic minor and harmonic minor scales. Sightreading: If time permits, students could also take turns sightplaying the cards drawn for one more element of learning. For private lessons, students could vary the game by playing "Don't Eat Pete" They first pick a pattern to sightread, then pull a snack off the square until the teacher shouts "Don't Eat Pete" on the forbidden square. Focus Piece Bingo: Instead of using keyboard skills pattern, copy and cut apart measures from the students assigned piece for 2 Bingo cards in advance and have them find the square with the measure the teacher played.